I've seen lifts, lorries and quids. So where are all the shillings? I knew before arriving in England that there are differences between Canadian English and British English. They ride up and down in lifts, wear trousers over their pants instead of pants over their underwear, keep their luggage under the boot of their car and deliver goods in lorries. I know all these things because I’ve watched British TV shows and movies, and read British books. Something has bothered me since getting here, though. I’d encountered most of the words I’ve learnt from TV since getting here, and even learned a few new words. One of those words I knew hasn’t appeared – Shilling. Pounds and pence, quids and pennies - I’ve heard lots of words for the money, but I’ve never seen or heard a reference for a shilling. That is because the shilling no longer exists. The British Pound dates back to the Sixth century, when King Offa of Mercia introduced the silver penny. 240 pennies weighed one pound, and thus £1 was worth 240 pennies. To split up the difference, the Shilling was introduced, equal to 12 pennies, meaning that one pound was worth 20 shillings. The coins adopted abbreviations based on Roman names, with the penny being abbreviated as d for denarii and the Shilling abbreviated as s for solidi. The pound took on the Latin librae, thus the L shape of the £ sign. Thus, prices were originally written as 3s 4d (3 Shillings and 4 Pennies). Over time, as with most things, instead of writing out the s, a short-hand of a slash was used, so that 3/4 became 3 Shillings and 4 pence. This was back in the days when “s” was written to look more like an “f,” and thus the slash looked somewhat like the first letter of Shilling. 3/4 would be spoken as “3 and 4.” By the 1960s the lowest bill was the 10 Shilling note, called the “Ten Bob,” and therefore a common budget price was 9/11, one penny short of the paper money. Calls to move away from this fractional system based on 12s and 20s and to a decimal system date back to the early 1800s, after France introduced the decimal Franc in 1795. Various schemes were proposed, from splitting the pound into 1000 Mills to replacing the Pound with the Royal (4.8 of which would be worth a pound). So that is what happened to the Shilling. 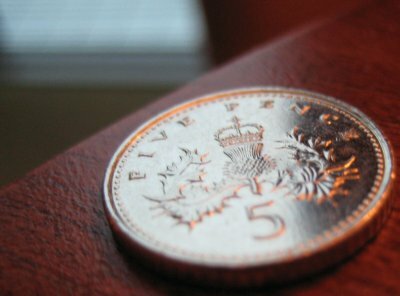 Previously worth 1/20th of a pound, it was replaced by a coin worth 1/20th of a pound, the 5 p piece. For a while folks would continue to call the 5 p piece a “bob,” the nickname that the Shilling had, but over time that disappeared as well. Today, the word Shilling is relegated to the past, but at least now I know when I am handling my change that those 5 p pieces would have, almost 40 years ago, been a Shilling. You know, I've wondered about that myself while in England. I never seem to remember long enough to investigate once I get home. Thanks!